Please use a modern browser to view this site. Join us for active, fun, and social Open Play sessions in Helena, MT! 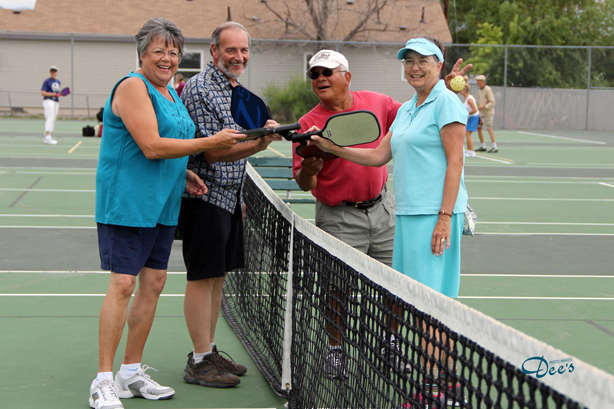 Beginner to advanced Pickleball players will enjoy the opportunity to learn the sport and/or work on their game with a wide variety of players. Paddles and balls are available to borrow, or bring your own. Outdoor Open Play sessions are played at the tennis courts at Barney Park during the summer. The city has kindly added permanent lines for pickleball on three tennis courts… using the tennis nets we have 3 pickleball courts, and using portable nets we can have 6 pickleball courts. Outdoor open play sessions are free, thanks to the city and our gracious Founder & Ambassador Emeritus Judy Feland, and our new Ambassador John Dayton. Indoor Open Play sessions are played at the YMCA gym in the winter. The YMCA added pickleball lines for three courts in the gym. YMCA members can play free, and non-members can pay a daily fee. Many thanks to Ben Wahl, Paul Paterson, and the Y for providing the courts and equipment for our use. Spring and fall sessions are usually played at one or the other venues, depending on the weather. Pickleball is usually played as doubles, but can also be played as singles. New players can learn the game quickly in a single session. No special apparel is needed, just something comfortable and appropriate for a court sport. Equipment is inexpensive and easily portable. It can be played at a leisurely pace or at a highly competitive level—making it ideal for all ages and abilities.